We want our Blog subscribers to stay abreast of industry trends. As the industry leader, we’re here to help the mobile performer; the lighting designer; the club owner; the event producer in intimate settings with that big-production feel. Remember: CHAUVET DJ staff are band members and mobile DJs, too! In addition to gig tips from the Blog, our social media channels display amazing user applications, video demos, and beauty shots of all your favorite fixtures. Keep your expertise creative and your gigs efficient. Which channels are best for your needs? Informative. Abundant. Fun. Love checking out product features? Regular viewer of Product Spotlights for in-depth tech talks? Fan of Halloween productions? In search of archived content for fixture assistance? Chances are, you’ve visited our channel! 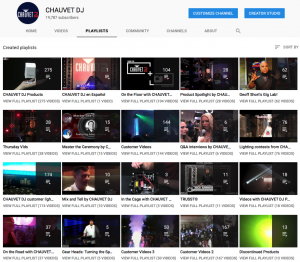 As a subscriber to the CHAUVET DJ channel, you’ll get instantly informed when our videos are published. Viewers can leave us comments, ask questions, engage with other viewers, and even check out some top releases before they hit Newsletters! Video Playlists keep navigation simple for a range of CHAUVET DJ videos to meet your needs. An open book into the minds of CHAUVET DJ! Follow the Facebook page for a one-stop shop to get a little bit of everything, content wise. Keep engaged with our brand. Sign in with your Facebook account to leave comments, send us likes (or loves), and share our content with your own followers! Continue to grow your own brand with engaging stories including videos, trivia, splash ads, event notifications, and more. We are always learning along with you, so we value your feedback. Bonus: CHAUVET DJ has implemented sub-pages around the globe to keep language translations a breeze for your markets! Globally sourced content in a concise format? Easy! Our Twitter account is here for you. Share our tweets and retweets from other end users who have incredible applications all around the world. We’d even like to retweet YOU and all your mobile lighting gigs. Looking for beauty shots, product spotlights, and CONTESTS? 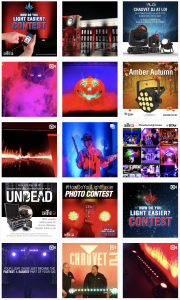 The CHAUVET DJ Instagram page is THE product collage your scrolling needs! 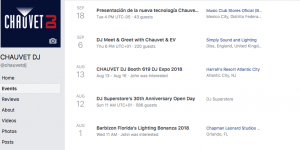 Leave us a like, a comment, and don’t neglect all the CHAUVET DJ hashtags for fellow user content. Yes, we mentioned contests…Stay tuned for more amazing product giveaways all for being an avid CHAUVET DJ user! Don’t forget to Pin us!